When you want a vehicle that can handle your busy lifestyle, choose the 2018 Honda Accord Sedan. Not only will this sedan car captivate everyone with smart looks, it contains engineering that makes driving more engaging and efficient. You’ll also revel in the clever designs throughout the interior, plus advanced onboard technologies. Find the right 2018 Honda Accord through the extensive selection at Mel Rapton Honda. The many changes included in the 10th-generation Honda Accord include some features that greatly improve performance. 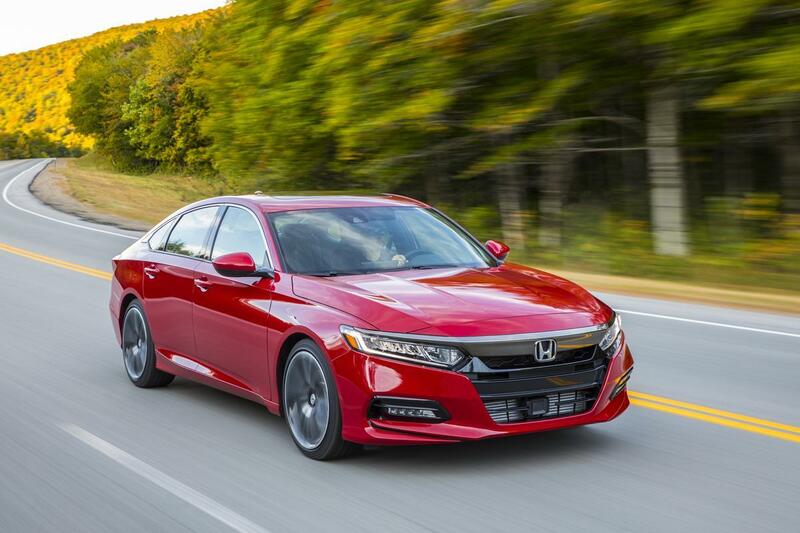 Certain Honda Accord models now feature a turbocharged inline 1.5-liter 4-cylinder engine. The single-scroll turbo works with an internal wastegate for amazing efficiency and responsive acceleration. It produces 20.2 psi of boost, helping the engine to whip out 192 horsepower and 192 lb.-ft. of torque. If you crave even more, the Honda Accord Sedan Sport, EX-L, and Touring can all be outfitted with a potent 2.0-liter 4-cylinder turbocharged engine. It has a similar setup as the other, including the internal wastegate. Boost increases slightly to 20.8 psi, while output grows to a stout 252 horsepower and 273 lb.-ft. of torque. Sport models use a 6-speed manual transmission, adding to their fun nature. The other Honda Accords can be outfitted with paddles to control the automatic transmission. No matter which version of the Honda Accord Sedan you select, the car comes with other systems designed to make for the best experience possible. The drive-by-wire throttle provides quick response, so you always feel in control. Hill-start assist is standard, as is an electric parking brake with automatic brake hold function. To increase comfort, active noise cancellation comes standard, too. The Eco Assist System boosts fuel economy. Through the Adaptive Damper System, your passengers feel fewer bumps in the road, while you enjoy crisp handling. You can also add smart entry to the car, making it unnecessary to remove the keys from your pocket or purse. When it comes to safety, this sedan has you covered. Drive confidently, because each Honda Accord comes with the Honda Sensing suite standard. Bundled together are advanced technologies like road departure mitigation, traffic sign recognition, collision mitigation braking, adaptive cruise control, and lane keeping assist. Other standard safety features include antilock brakes, electronic brake distribution, brake assist, a multi-angle rearview camera, vehicle stability assist, and traction control. An optional blind spot information system also includes rear cross traffic alert, so you know when a vehicle is approaching from the sides as you back out of a spot. Prepare to meet your diverse needs, because the Honda Accord Sedan interior caters to both drivers and passengers. All controls and seats feature ergonomic layouts, so you stay comfortable, even during long journeys. That combines with premium materials, including an available leather-wrapped steering wheel, for a premium feel you’ll appreciate. Honda even design the interior with your outward visibility in mind. As a driver, you’ll notice that the windows sit unobstructed, so you can more easily spot other vehicles, pedestrians, cyclists, and whatever else. You also can customize the 7-inch driver interface screen in the gauge cluster, showing the information you need at any given moment. Learn even more about the all-new Honda Accord Sedan by coming to Mel Rapton Honda.